Lassig, a European company known for its diaper bags and children's accessories, has introduced their Glam Signature Bag to the US market and they can be purchased through HABA. Available in four colors, I received the red Glam Signature Bag. Designed as Lassig's first purse, it can also be used as a diaper bag. I don't have little ones, so I've been using it as a purse. Made of polyester and nylon, this stylish bag is roomy and has lots of compartments. The material makes it easy to wipe clean with a cloth. 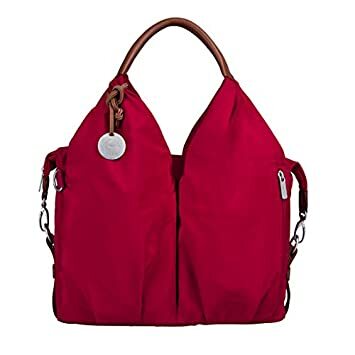 The red color of the bag is very vibrant, and it has sturdy brown handles. There's also a brown adjustable shoulder strap that can be clipped on and off as desired. I carry a lot of items in my purse. Imagine everything but the kitchen sink. With its many compartments, I can group similar items together without having to hunt forever and a day. There's the large main compartment with additional compartment sections inside. Outside is even more compartments and zippered pockets. I like the chic design of the bag and the organization it helps provide. If you choose to use the Lassig Glam Signature Bag as a diaper bag, you can purchase a Signature Bag Accessory Set separately. They are available in the same colors as the bags. 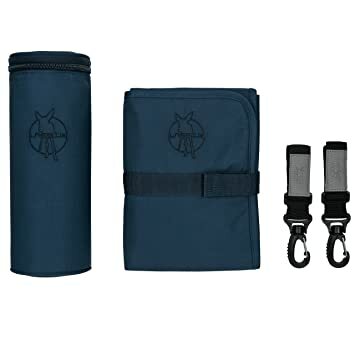 I chose navy for the accessory set, which includes an insulated bottle holder, stroller hooks, and changing pad. The changing pad is water repellant and folds up when not in use. The insulated bottle holder fits one bottle, with some room left over. The accessories are convenient to add to the Glam Signature Bag, and even fit in there nicely. The color is so nice and pretty. Looks like a well made bag for sure. This would make a great baby shower gift. It is so much cuter than anything I found in stores when I was looking for one. That bag is so cute!I love purses that have lots of compartments since I like to carry a mini color book and pens with me.Always have to be prepared. Lol! This looks like a great handbag. I like the stitching a lot. I appreciate your great review.